This video was shot in Paris during the summer of 2007. 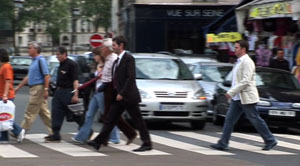 I hired a camera operator to document me trying to copy the gait of Parisians and tourists as they walked throughout a busy section of Paris near Hotel de Ville. I composed the soundtrack to complement and at times antagonize with the soundscape of the location. The work brings up questions of mimesis, how artists choose to represent the world through art, and ultimately why we copy European art.